Bumper Stickers are a great Trade Show Premium. Give-a-ways and hand outs at Trade Shows are always expected. Our Bumper Stickers are not just for Trade Shows. Bumper Stickers may be used for any occasion. 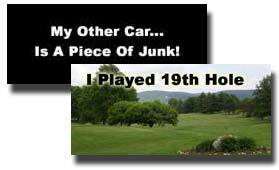 Design your own Bumper Sticker. Contact Mike for details. Full color graphics at no extra charge. $300.00 for 200 Bumper Stickers. 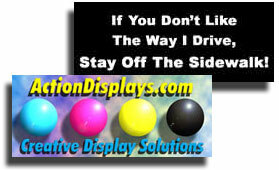 Full color Bumper Stickers no extra charge. Fast Bumper Sticker turn around times.